Raph, Leo and Mike begin their assault on Komodo Industries. Raph kills a guard on their way in, which angers Leo. The two argue until they find a vantage point where they can spy inside the building – they see Master Splinter having tea with Lord Komodo. Inside, the Dragonlord explains that his bloodline of the Dragon Spirit is accursed, and rather than being able to transform into a dragon at will, he can only become a komodo dragon at random intervals. Lord Komodo also states that his followers will only remain loyal to him if they believe that he can become a dragon – so Master Splinter must die to keep the secret safe. The Sensei is then overcome by a drug in the tea that causes him to pass out, and he is dragged from the room. Outside, Mike reports the events to his brothers, and they prepare to attack. Meanwhile, Don stands over the fallen form of Mako as he struggles with the computer voice that controls his robotic body parts. Mako awakens and flees, and the cyborg machinery turns to fire at it, but Donatello gains control of the mechanix and allows the beast to escape. Don then has an inner dialog with the computer, which believes it’s still the human host. Donatello explains that the human part of the cyborg is dead and all that remains is the machine. Don then tells the computer to delete all data regarding the previous host organism, thus removing the voice in his head. The ninja then decides to spend a little time learning about his new body’s abilities before he launches his own attack on Komodo Industries. Inside Komodo Industries, the Dragnolord’s scientists are preparing to inject Master Splinter with a Mutagen extract. Lord Komodo tells the Sensei that the injection may mutate him beyond recognition – but before the serum is injected, Pimiko demands to speak with Splinter, as he had mentioned Hamato Yoshi earlier. We then discover that Pimiko is Shredder’s daughter and she wants information about Yoshi’s clan. Splinter tells the woman that Shredder was evil and deserved to die, which angers Pimiko and she demands to face the rat in combat. Lord Komodo refuses, telling her that she would be defeated. Just then, Leo, Mike and Raph crash through the windows of the room and attack. In the confusion, the Komodo Industries doctor injects Splinter – which enrages Pimiko and she kills the man. 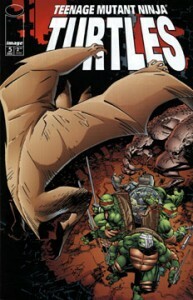 Pimiko then briefly joins the Turtles in battle against the giant komodo dragons – much to Raph’s surprise. Raphael frees a groggy Splinter and Pimiko shows him an escape route. Shredder’s daughter then tells Raphael to assist his brothers – she will not fight her Kunoichi warriors, but she will not allow anyone to pursue Master Splinter. Raph joins Leo just as a huge, bipedal komodo dragon mutant arrives. The monster gets the upper hand in the battle and is about to devour Leo when Donatello arrives and blasts it (and the room) to smithereens. A quick but joyful reunion between the brothers is celebrated, and then Pimiko opens the escape route for them and states that Lord Komodo has activated the destruct mechanism – giving the mutants only three minutes to escape. The TMNT make their way through some caverns filled with bats when they stumble into a giant bat-mutant that cries out, “Skree! Not hurt Splinterrr!” before it flies off in a panic. The guys get outside and pile into the aircar to chase their mutated master, just as Komodo Industries erupts in a ball of fire.